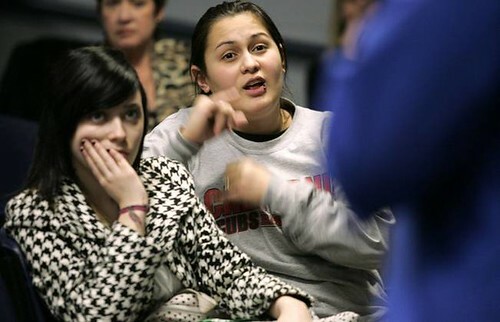 Image caption: Janeth Gastelum, a Liberty senior, asks a question Thursday during a presentation by a representative from Gallaudet University, an undergraduate liberal arts university in Washington, D.C., for deaf and hard of hearing students. At Liberty High School this week, the queries came in rapid succession for Nick Gould, a recent graduate of Gallaudet University, the world’s first higher education institution for the deaf: How big is the college? How many dorms? Are there varsity sports? What about scholarships? What I am wanting to say here is twofold. Sometimes the cure is worse than what one is seeking to alleviate. Alcohol allowed more words to flow, but the words were not good ones. They no more represented my true self than my silence had. This is the classic teaching case for engineering risk. Anybody associated with medical devices ought to have heard about it. The lessons learned were clear-cut, one of the most significant being that any such device ought to have a mechanical, non-software-controlled, interlock to prevent its operation with no shields in place. Stop telling me to go see Avatar in IMAX/3D. […] Think about that next time you ooh and ahh over some new technology. Is it new technology for everyone? Or just those privileged with a culturally approved set of sensory organs? [Stephanie Enyart] said that in order to read material on a computer effectively, she needs a combination of magnified text and a software program that reads portions of the text aloud. The California State Bar agreed to allow her to use the technology combination for a portion of the exam, but the National Conference of Bar Examiners refused to allow her to use it for two other sections controlled by the national group. The group contended that Enyart’s plan would endanger security of the material and that other accommodations it offered would meet the requirements of the U.S. Americans with Disabilities Act. Outside of court, Enyart said, “I’m glad I now have the luxury of just worrying about the bar exam itself”. Smith, of Miami, is raising Sharett and two other young children on about $1,000 a month in Social Security disability and survivor’s benefits. His wife of 26 years died of a brain tumor. The $200 to $300 he spent each month for diapers for Sharett represented 20 percent or more of his budget. I find it kind of strange that in the first article, Gallaudet is presented like something new. They should have made a quick note of its history… I would have commented there, but you need to register. On Jonquil’s post: As a programmer, it utterly baffles me that something would be designed like that. Why would there not be a mechanical failsafe? Why would this be entirely controlled by software, if there was even a remote chance that the software wouldn’t work as expected (as there tends to be)? YES at hkfreeman’s rant; this is something I also brought up in a comment on Shakesville’s “2-D or not 2-D” post. And on the same note, in some cases it can be difficult to even find a theater with captioning. There are none in my entire city. None. The nearest one is over a half hour’s drive away… with no transit accessibility from here, naturally. Is it any wonder I usually just see things at the dollar theater, and then still rent them on DVD when that’s released? On the bar exam: I totally understand Enyart’s issue; if I were to lose my vision, I’d likely end up using magnification or learning Braille because dealing with a constant stream of auditory input is just overloading with my auditory processing disorder. If someone communicates through the use of an ASL interpreter, why is it even relevant in a context like this and in written format? What difference does it make? I mean, the fact that the author felt it worth commenting on that he used an interpreter to help facilitate communication to me suggests the implication that somehow communication through ASL is somehow inferior and a less valid means of communication than “normal” oral communication. I see it as another way of denying them their autonomy. But then again I’m not deaf, so I’m hardly an authority on how these things are perceived. Niall – I think it’s fairly common practice to mention that an interpreter was involved when the interviewee is speaking a language the journalist doesn’t understand.